Marrybrown is back! If you would like to try something different other than the usual fast food restaurants, head to Marrybrown, now open at iFLY Sentosa! Their Ultimate Chicken (Crispy chicken) is at 50cents per piece for the first 50 customers everyday, limited to 1 pc per customer, till 13 September 2015. 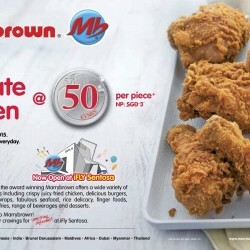 MARRYBROWN, the award winning Malaysian-owned has a halal menu featuring a wide variety of tasty meals including Crispy Chicken, Delicious Satay Burger, Nasi Marrybrown, Speciality Wrap, Fish ‘n’ Chips, Mi Kari, Chicken Porridge, finger foods, salads, fun fries and a range of hot and cold beverages and desserts – the only one of its kind in town and really “ something different “ for everyone.